United States Supply is among the acknowledged world leaders in the supply of endless Rubber Belts for SANFORIZER or Compressive Shrinkage machines (CSM). Textile Finishing Mills in more than 70 countries are currently using SHIELD� Rubber Belts because of their quality, durability and longevity. For maintenance products click here. SHIELD� Rubber Belts are manufactured in an ISO 9002 certified facility. Superior Manufacturing Process helps eliminate air pockets and blisters. Better Resistance to Cracking and Tearing. Outer Finished Surface (Face) - Rubber Belt is ready for production without additional grinding. 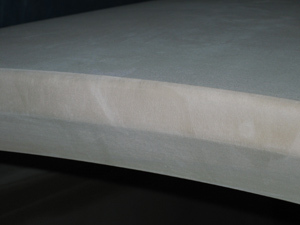 Inner Finished Surface - Exceptionally smooth to resist abrasion. Patented Shipping Crate - less accidental damage to Rubber Belt during inspection and unloading. Four Standard Edge Designs as diagramed. Contoured edges increase life by reducing edge cracking. Patented REVERSE BEVEL design to reduce edge stress, water transfer to face, and maximize face width of belt. Please call for additional information on this new edge development. SHIELD� I-C (36-39 Shore A) - is specifically designed for applications requiring maximum shrinkage such as denim. The lower durometer belt offers better recoil and a better grip on the fabric to enable greater shrinkage. This extra shrinkage is obtainable with less rubber belt compression. This translates into longer life and reduced cost. 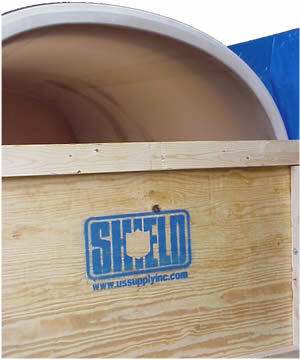 SHIELD� I (39-41 Shore A) - is ideal for all-purpose applications where high shrinkage and "hand" fabrics are run. 2 5/8" (67mm) - is typically used to shrink medium to heavy weight fabrics. 2" (51mm) -is used primarily to impart a softness or "hand" to fabric; with light to medium weight fabrics; and on "Comfit" machines to shrink knitted fabrics. Note: A special non-yellowing component is available when installing on a "Comfit" machine. Please see SHIELD� I-C above. United States Supply Co., Inc. has been supplying Rubber Belts and Felts for controlled compressive shrinking machines for over 40 years. Consequently, we have an extensive knowledge and understanding of SANFORIZING. We are proud to consider ourselves experts in this field and have employees with more than 100 years of combined experience to help assist our clients. Please feel free to take advantage of our knowledge and expertise. Any inquiries or questions can be faxed to (704) 393-5628 or e-mail us at support@ussupplyinc.com. For maintenance ../products click here. Your company name, address, telephone, fax and e-mail numbers.